A pie and mash meal from a leading pub chain contains the same amount of salt as 15 packets of crisps. That's one of the headline figures that the MHF-backed Consensus Action on Salt and Health (CASH) are using for this year's National Salt Awareness Week (21st – 27th March) to draw attention to the dangerously high levels of salt in some pies. A Wetherspoons' Chicken and Mushroom Pie was the offender in this case. 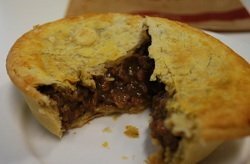 Men are the target group for this year's Week so pies have been targeted because they came out on top in a survey of men's favourite foods. In a Public Opinion Survey commissioned by CASH, almost half of men - 46% - said that traditional English meat dishes such as pies, steak and sausages were one of their favourite cuisines. Men are putting their health at risk, say CASH, by eating the equivalent of 365 pints of salt in a lifetime. The aim of this year’s Week is to raise awareness amongst men of the dangers. In the UK, over twice as many men as women die prematurely of heart disease, heart failure and stroke (34,431 men under 75 compared to 16,664 women according to ONS death statistics for 2008). The new survey looked at 526 pie, mash and gravy products from supermarkets, large chain pubs, cafes and takeaways identifying the best and worst choices. All the pie and mash pub meals looked at contained more than 3g, half the daily maximum. Check out the full tables here: Who ate all the (salty) pies? Although there has been good progress in reducing the salt content of pies available in supermarkets, according to CASH, 1 in 10 products still fail to meet the government's 2010 salt reduction targets. Pubs fare even worse. Unlike in supermarkets where almost all products surveyed have some nutritional information and 70% have front of pack information, most pubs, cafes and takeaway outlets do not. The maximum daily recommendation for salt is 6g a day (about a teaspoon) however, men currently eat about 10g of salt a day, the equivalent of 365 pints of salt in a life time, with young men eating even more according to a 2008 report. CASH’s public opinion survey commissioned for the Week found that only 1 in 7 (15%) men knew that 6g was the daily salt maximum recommendation with as many as 1 in 10 men (10%) incorrectly thinking they should eat TEN grams or more of salt a day. 'With the food industry still putting so much salt in men's favourite foods, it is no wonder men are at risk of serious health problems such as stroke and heart attacks, the commonest causes of death and disability in the UK,' said Graham MacGregor, Professor of Cardiovascular Medicine at The Wolfson Institute and Chairman of CASH. 'Cutting men's salt intake from the current 10g a day to the recommended maximum of 6g a day could reduce their risk of having a stroke by up to 20% and of having a heart attack by up to 12%.' These figures are from an article How Far Should Salt Intake Be Reduced? published in the Journal Hypertension. As well as the MHF, National Salt Awareness Week 2011 is backed by the British Heart Foundation, The Stroke Association, National Osteoporosis Society, Cancer Research UK, National Heart Forum, Blood Pressure Association, National Obesity Forum, Kidney Research UK, Asthma UK, Meniere’s Society and Alzheimer’s Society.